Yesterday, I got to share the news about Lola Rayne’s debut release (that I am SUPER DUPER excited about!!!). Today, it’s my turn to share my news. Ladies and gentlemen, I give you the new and improved cover for Burning, the short story prequel to the Demon Legacy series!!! I wasn’t originally planning on redoing the cover but as I was doing the cover art for The Devil You Know, the old cover to Burning looked SEVERELY out of place. That led to a makeover. 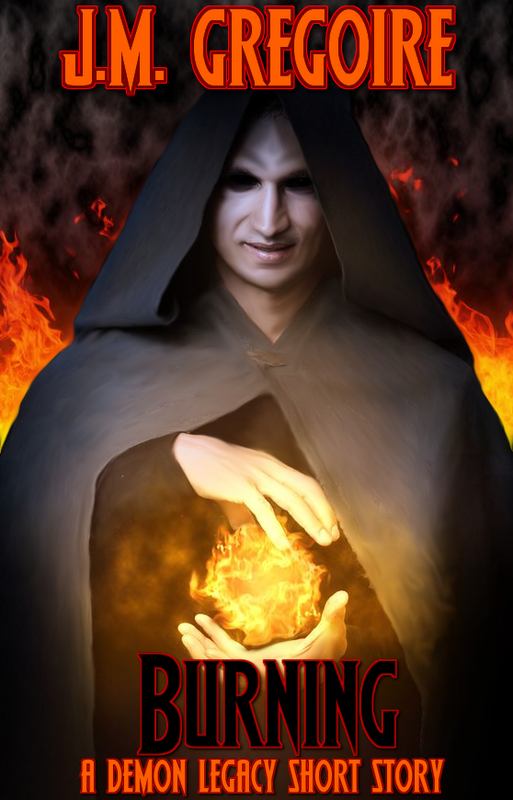 Nine cover versions later, you guys get Mr. Creepy Pants for the cover of Burning. He was actually going to be one of two characters that graced the cover of The Devil You Know but once I had the first draft of the cover mocked up, the general feedback was “ICK!”. I had an email brainstorming session with an author friend of mine and we both agreed that although he needed to get off of the cover for TDYK, he totally belonged with Burning. One more late night of artwork later, I had the next draft of the new Burning cover. Revise, revise, revise and this is the final result. The other change that was made was the font and font color for the series. The more I stared at that old font, the more I hated it. And people agreed. So I fished through my generous font library and used one that I have been in love with for a long time. Not only do I love the font alone but I also feel that it conveys the “urban fantasy” feel a little better. I will be going through the site to change it on each of the pages shortly. That will be a project coming someday very soon! Previous postOMG OMG OMG OMG OMG!!!!! Wow! Wow! This cover has a lot more impact. Wow! Wow! Wow! This cover has so much more impact! Definitely has the urban fantasy feel. I like it! I’m so excited to read it!